For a few months now I have had this overwhelming craving for the color orange. 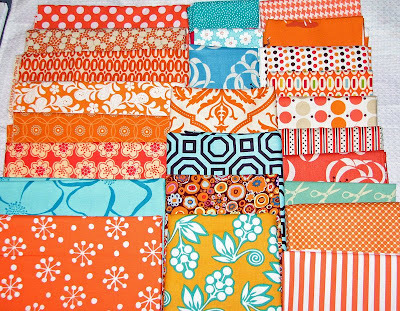 I have been gathering orange ans aqua prints to put together in a quilt for myself. It will be the first quilt in my whole fifteen years of quilting, that I have made for myself. I am usually a quilter of gifts. I have always given away my quilts as gifts, and have not one to show for the fact that I even quilt. So I am gathering still and not sure what prints will actually end up in the quilt when I sit down to do it. I think the aqua will spice it up a bit to. So Orange and Aqua quilt.. And tons of white in it to, what do you think? LOVE the oranges, aquas and whites--so refreshing! I can't wait to see it! Sounds great to me. I like the choices so far. Gorgeous fabrics!!! I am on an orange kick lately too, I love it! What do I think??!! I think I need to wipe the drool off my keyboard. I have also fallen in love with those colors, and I never liked orange before. I now see it in a different light. the quilt will be beautiful, and it should be for you, one to enjoy and call your own! I've been on an orange kick for about a year! I love your choices, I think it will make a really beautiful quilt! And GO YOU for keeping a quilt! I've been quilting for less than a year and have yet to make one for myself... BUT I have decided my couch needs a cozy quilt, and its on my list to do. Seriously - 15 years? You're far too generous! Fabulous colour combination Terri, should look great. It will be stunning Terri, I love that colour combo and really want to make one of my own. I think Orange is the new neutral!! I love it and just finished two orange/blue/white quilts. that is going to be beautiful...i can not believe that this will be your first quilt for yourself. I agree - this is going to be one beautiful and fantastic quilt! I totally understand the whole I have made lots of these but not one for me syndrome. It will be just lovely! Do you have any ideas for what pattern you will do, yet? I've tagged you with an award - see my blog for details. Great minds think alike. I will have to post when I get mine a bit more put together. I have been addicted to orange for the last 6 months, which is odd since it was a take it or leave it color before that. Can't wait to see yours as it progresses. I am all about the orange and blue lately! You've selected some great fabrics - can't wait to see the finished product! Looks good! The millefiore print doesn't seem to go with the others as well overall, but it will look fine i'm sure in the quilt itself. Love, love, love them! I say mix it up! Have fun, you deserve your own quilt! I think it will look fantastic! Great colours, can't wait to see it!